Zusammenfassung: Der Untergießvorgang bei der Erstellung fester Fahrbahnen wurde mit Radar zur Qualitätskontrolle meßtechnisch verfolgt. Radar wurde eingesetzt zum Nachweis, daß das Untergußmaterial alle Stellen erreicht. Der Verbund zwischen der Betonplatte und dem Untergrund wurde nachträglich mit Ultraschall, Impact-Echo und Radar gemessen. Diese Verfahren können zur Qualitätskontrolle bei der Erstellung fester Fahrbahnen eingesetzt werden. A new attention towards innovation is currently apparent in the construction industry and interest is growing in NDT as a tool for performance criteria. An example is reported of combined application of NDT techniques on an innovative railway system. A strategy was identified on how to proceed in the testing in order to get the best outcome from the combined use of various techniques so that the information regarding the presence of defects could be refined. Also, attention was placed in examining the effectiveness of alternative NDT techniques with various testing purposes. A new radar application was experimented in this campaign where, to monitor the progress of injection of bitumen mix under concrete, the antennae were kept stationary. For the first time Impact Echo was employed to produce 2D sections of the concrete elements. Ultrasound technique could clearly differentiate between good and bad bonding below concrete. This change in attitude towards technology is also perceived in a restricted sector of Civil Engineering such is the NDT (Non Destructive Testing) field. This area, which started with valid and encouraging example applications has not developed in the last one or two decades as at first hoped. Nevertheless now the interest in it is growing both from industry and the public sector with requests of NDT investigations and higher levels of investment mobilitated. What follows is an example of application of combined NDT techniques where the quality of the results together with a demonstration to the customer of the procedure followed during data collection has accelerated the adoption of an innovation such as the railway system under investigation. 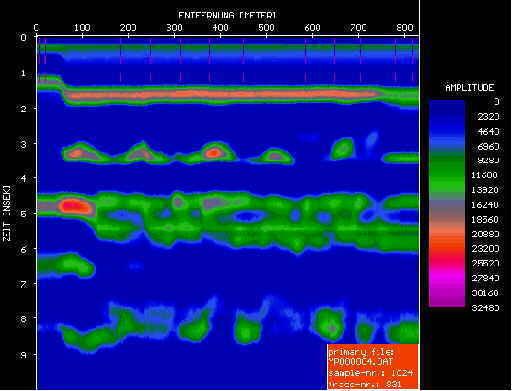 Furthermore the monitoring of the system via NDT has become a requirement for its adoption. It is nevertheless important to stress that with NDT there is still a need for accurate planning of the tests and carefull data interpretation by skilled operators. Qualities which are not always of SMEs present on the market. On-Site quality control with NDT methods during the construction process is a powerful action to ensure that the design parameters for railway constructions are met. Long term durability, uninterrupted service, improved safety of passengers and reduced maintenance costs are a direct consequence of such tests. For a new type of construction, the correct realisation of the construction process had to be verified through NDT. Radar, Ultrasound an Impact-Echo techniques were applied in this successful feasibility study. The new generation of train tracks for high speed travel must meet the demand for safety, speed and comfort of the passengers. "Feste Fahrbahnen" do have the stability for the high speed traffic but their construction must be done in a different way. The traditional loose ballast is fixed by mortar or asphalt or totally replaced. The sleepers are fixed in the sub-structure or e. g. replaced by large concrete plates which are connected into one "infinite" plate. 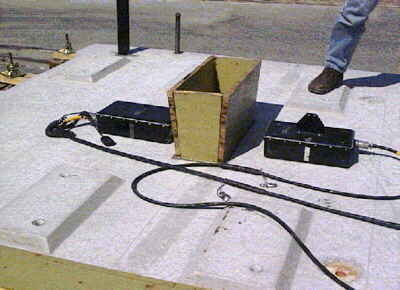 On this experimental system for railway line construction, measurements were aimed at testing whether state of the art NDT techniques were capable of monitoring the correct on site assembly and laying of new concrete sleepers on a bitumen mix layer. This was particularly important and delicate in that the possible go-ahead from the costumer, the national railway company, to proceed with laying a stretch of railway, depended on the quality of the results obtained from the NDT investigation. The system is made of pre-fabricated concrete plates mounted on site above the substructure (asphalt) and binded to it by injecting bitumenous material. The investigations included both the phase during filling with the mix under the sleepers and, after setting, testing of the fill. to measure the bonding between the concrete plate and the solidified injection materials detecting the possible presence of defects. One of the research goals was to identify a strategy on how to proceed in the testing so to get the best possible outcome out of each technique and what each one could actually achieve compatibly with the limited time resources, given also the number of specimens to undergo investigation. Furthermore, from the combined use of the various techniques it was hoped that not only the results from one could be confirmed by other techniques, where possible, but that they could complement each other in carrying out a thorough investigation and in refining the information regarding the presence of defects, their location, depth and possible size. Eventually the experience obtained from these tests would bring to the development of guidelines for systematic testing of this railway system. Radar is a NDT technique based on the propagation of electromagnetic (EM) waves of high frequency: typically between 300 MHz and 2.5 GHz for civil engineering applications. The waves are emitted by an antenna which is generally in contact with the structure under investigation and moves along on the surface. The waves travel through the element and are reflected from material interfaces i.e. materials with different EM properties, such as in the case of different layers, air voids, metal and other inhomogeneities. The reflections are then picked up by a receiving antenna, also positioned on the surface. 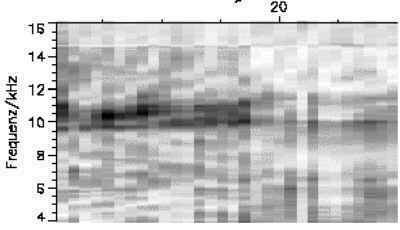 Radar then uses these wave reflections to build up pseudo 2- dimensional plots of the inside of the structure and its boundaries. The travel time of the wave to the various interfaces is used to calculate the depth or thickness of features of interest. In Impact Echo a mechanical point impact is applied on the surface of the concrete element to undergo investigation, thus a transient stress pulse is generated and propagates into the concrete. The wave, travelling through the material, is partly reflected by any internal interface or discontinuity such as reinforcements, ducts, defects, delaminations, and almost completely reflected if the second material is air, for example at the external boundaries of the element. 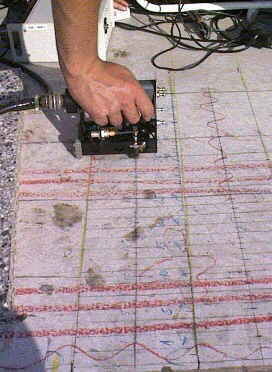 In order to use the ultrasonic pulse echo method on concrete, low frequency transducers have to be used (centre frequency from 50 to 200 kHz). At BAM it has been developed a version of the method that uses the principle of synthetic aperture. 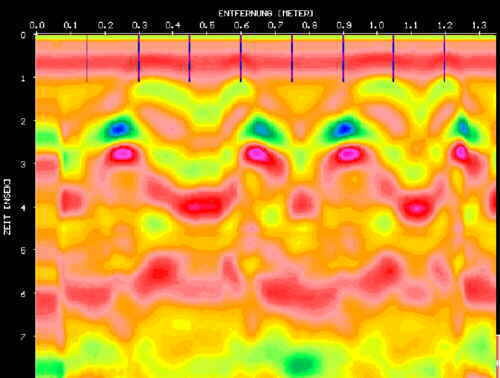 That means, ultrasonic A-scans (ultrasonic signal vs. time) are recorded at different points on the element surface, and any internal reflections are evaluated after using a reconstruction algorithm. The version of the method used here works with separated sending and receiving probes. An array of 10 transducers is used, where each one - driven by an electronic switch - is used alternatively as sender and receiver. Thus one data set contains 90 different A-scans. The approximate diameter of the array used in the experiments described below is 25 cm. For the reconstruction the A-scans are timeshifted, so to be superimposed. To improve the depth resolution, an integration method is applied, so that the result of a measurement is presented in curves showing the reflected ultrasonic energy vs. depth. Reflections from backwalls and interfaces, which are the features of interest, result in maxima in those curves. For further details concerning the method refer e.g. to [3-6]. In fig. 15 the array is shown at a measuring position on one of the concrete elements. The site location, a full scale testing set-up at Max Boegl, Neumarkt, comprised 5 sleepers (fig. 1). To simulate full site conditions, first a sub-layer of compacted gravel was laid at a slope with gradients both in the longitudinal and transversal direction. A layer of asphalt approximately 30 cm thick was laid above it and on top the sleepers were positioned in a way to remain lifted about 4-5 cm above the asphalt. This air layer was later to be filled by a bitumen mix material that, once set, would bind the sleeper to the sub-ground (fig. 2). A temporary formwork was therefore cast around each sleeper during filling, to contain the liquid bitumen mix. For the purpose of testing, two artificial voids were created under plate 4 near two of the inspection holes, approximately at position A and B in figure 3. These voids, of circular shape and thick as the layer to be filled with the mix, were approximately 25 cm in diametre. As mentioned above, the investigations carried out involved testing a number of sleepers. 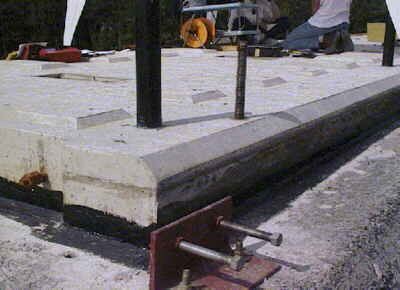 The results reported here refer to the testing of the underneath of two of these heavily reinforced concrete plates, with 2 main purposes: in the first phase the monitoring of the injection between the concrete and the asphalt layer below; subsequently the localisation of an artificial void. For the first goal, it was concluded that only for radar the data acquisition rate was fast enough to keep up with the rapid changes due to the progress of the fluid fill front and the raising of the fill level. Furthermore, radar also offers the advantage that collected data can be seen on the screen in real time. To locate the position of the voids it was thought that the best approach would be to use first the technique which more rapidly could cover an extended area to be tested (radar), so to identify the voids or the areas of possible interest. 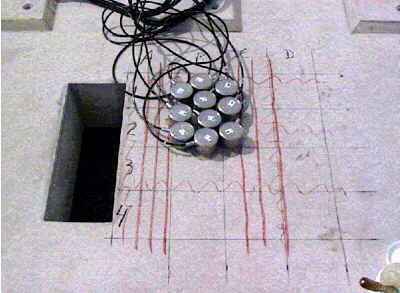 Then to use the techniques which could refine the information by sizing the voids (Impact-Echo and Ultrasound). Reference measurements were carried out on a plate before injection, with two orientations of the antenna, to evaluate the influence of reinforcement in the concrete and decide on the appropriate antenna frequency to use (fig. 4 and 5). Radar measurements are normally carried out by moving one antenna along survey lines on the structure surface while collecting data in continuous. In this particular case, while injecting, "the media" under investigation would "change" during the course of the test itself, because of the presence of the fill. Therefore, in this experimental application the antennae were kept stationary at fixed positions on the surface. See fig. 6 and fig. 3, Fertigteil 5, locations 28 and 29. To locate the voids, as their approximate dimensions were known, the radar scanned the plate surface along lines approximately spaced as half the diameter of the defect. A grid with lines 15 cm apart in both directions was marked out and areas of interest were so located. In order to test the function of the method for the given problem, several points were measured at the reference plate. The bonding of the bitumen layer to the underside of the concrete plate was controlled at about 15 points on plates 4, and 5. The void positions on plate 4 were also investigated. From the reference measurements performed with different polarisation of the antenna, reinforcement was located. It was seen that the reinforcement mats have great influence on the data and can mask the reflection from the bottom of the plate (fig. 4); instead, when the orientation of the antenna is correct, influence from the reinforcement is reduced and the reflection from the bottom can be clearly seen at 4 ns (fig. 5). This allows calculation of the plate thickness. Data presented here were collected with 900-MHz antennae. The testing of the injection proved successful with the passage of the fluid front under the antenna clearly identifiable. The rise of the fluid level is also visible until the whole air gap is filled and the injection can be considered completed (fig. 7). At this point, the antenna can be moved to a new position where the fenomenon is monitored with similar results (fig. 8). To be noted that the x-axis on these plots represents time and not distance like in conventional radargrams. Because of the particular location of the voids, in close proximity to the central inspection holes and in areas where the first reinforcement mat is denser, their position was not certain. It was only after laboratory data processing that the voids could be seen. In fig. 9 the void at location A is visible at 5 ns on the depth scale. Output data from the reference plate highlight the concrete thickness. 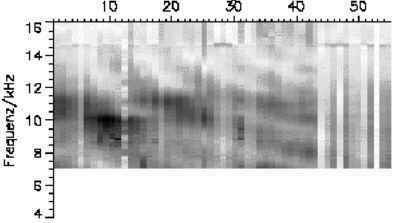 Data are shown in frequency plots where the peaks at 10.5 kHz correspond to the reflection from the bottom of the concrete: figure 11 represents the averaged row data from a 50 cm long survey line. Figure 12 shows a 2 dimensional plot through the concrete thickness of the same processed data. 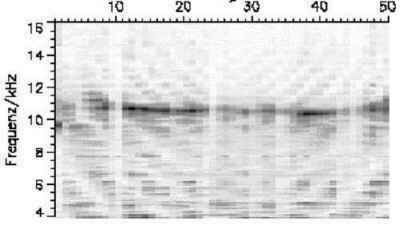 In figure 13, showing data collected along line 4 in fig. 3, the location of the air void in the bitumen mix layer can be seen between stations 5 and 15 on the x-axis. Finally in figure 14 possible areas of good bonding between concrete and underlaying bitumen-mix are located. 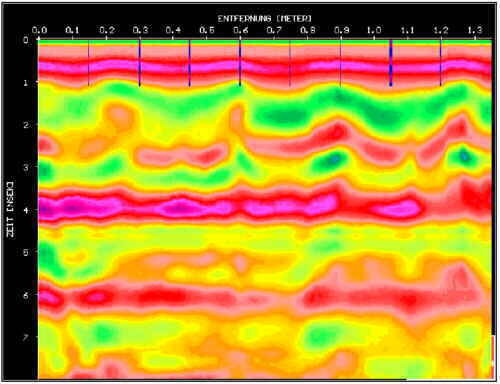 Fig 11: Averaged IE data Fig 12: Processed 2-D frequency "section"
One example of reference data is shown in fig. 16,a (position 20 in fig. 3) where the graph shows depth vs. amplitude. The clear maximum at 190 mm is due to the echo from the backside interface concrete/air. The value of the thickness is slightly smaller than the true thickness of the plate (200 mm) because of the ultrasound velocity chosen for the calculation. This value was a little underestimated, as shown by measuring the velocity on cores taken later. From the measurements of bonding of the bitumen layer to the underside of the concrete plate, a typical output of what is interpreted as good bonding is shown in fig. 16,b (position 10 in fig. 3). A strong maximum at 190 mm indicates the interface concrete/bitumen whereas the back face of the bitumen layer produces the second maximum at 240 mm. The existence of the second echo indicates that there is an acoustical contact between the concrete and the bitumen, but the intensity of the echo is higher than expected compared to the second echo, when a good bonding is assumed. Bore holes taken later at typical points confirmed a good bonding of the layer but also showed the presence of small air bubbles at the rough backside of the concrete plate. These bubbles are probably the reason for the relatively high reflection at the interface. In plate 4, at the position of the two artificial voids, the air layer could be clearly shown by the ultrasonic pulse echo method. Figure 16,c is the Ultrasound result for position 13 where only the interface concrete/air appears at 190 mm, the ultrasonic waves are totally reflected in this region. The result is similar to the reference experiment shown in fig. 16,a. Regarding the bitumen mix injection, the use of Impact-Echo and Ultrasound was not applicable. Instead, the fast radar data acquisition rate permitted to succesfully monitor the rapid changes in the fill and to follow data collection in real time on the screen, thus allowing to see when the injection could be considered concluded. From this use to monitor the injection process, follows that radar technique may be found useful also in similar applications for example to monitor concrete pouring in new buildings or mortar injections in reabilitation of buildings. The combination of the three NDT techniques was very positive in localising the voids in the set bitumen fill and in dimensioning them, although the position of the voids themselves were the less favourable. The investigation of the bonding between concrete and set bitumen mix gave initial encouraging results in discriminating between good and bad areas. The authors gratefully acknowledge Mr P. Iff and Mr Reichel from Max Boegl, Neumarkt, for their collaboration and facilities provision during the testing campaigns and for their availability to the publication of this paper. Head P.R. : Effective research and development for future innovations in the construction industry, keynote paper, SEWC'98, S. Francisco, July 1998, K1. Colla C., G. Schneider, J. Woestmann und H. Wiggenhauser: Automated Impact-Echo: 2- and 3-D imaging of concrete elements, in these Proceedings. Mielentz F., B. Milman, M. Krause und H. Wiggenhauser: Praxiseinsatzeines Ultraschallecho-Verfahrens zur Strukturuntersuchung von Betonbauteilen, in these Proceedings. Krause M., F. Mielentz, B. Milman, W. Müller und H. Wiggenhauser: Hüllrohruntersuchungen mit bildgebendem Ultraschallecho-Verfahrens, in these Proceedings. Krause, M.: Bildgebende Ultraschall-Impulsecho-Untersuchungen an Betonbauteilen, 33. Forschungskolloquium des Deutschen Ausschuß für Stahlbeton, Berlin, 10./11.10.1996, BAM, DAfStb, Berlin (1996) S. 94-101. Colla C., G. Schneider und H. Wiggenhauser: Automated Impact-Echo: method improvements via 2- and 3-D imaging of concrete elements, SFR'99,London, July '99, accepted for publication.